This has been a particularly trying week for the Church. Some high-ranking officials, led by a former U.S. papal nuncio (roughly equivalent to an ambassador) have, based on accusations that Pope Francis aided in cover-up of abuse, called for him to resign. What does this mean and how should we respond to it? Flooding the media this week have been reports that Pope Francis, upon taking the office of the papacy in 2013, was made aware of sanctions put into place against ex-Cardinal Theodore McCarrick due to abuse claims, yet chose to put those sanctions aside. As a result Archbishop Carlo Viganò, former papal nuncio to the United States, has called for Pope Francis to resign, a call that has been reportedly taken up by other Church prelates. Although I will not attempt to address the validity or veracity of these charges - that goes far beyond the scope of this article or the authority of this author - it does pose an important question: what happens now? Can the cardinals come together and vote to impeach the pope? Here we see a big difference between American constitutional law and Catholic canon law. Although there are procedures for the deposition of deacons, priests and bishops in situations that require it, there is no provision in the Code of Canon Law for the removal of a Pope. Even if the Pope should become incapacitated or unable to carry out his duties because of illness, age, imprisonment (which has happened in history) or even incompetence, there is no earthly body - College of Cardinals or otherwise - that can force him to resign or impeach him. 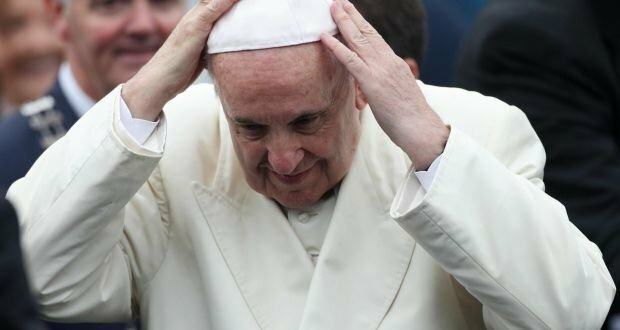 He can only step down on his own volition (which has happened very infrequently in the history of the Church; most recently was the resignation of Pope Benedict XVI in 2013). There is very good reason for this supposed "hole" (a lacuna legis) in canon law. Putting such a provision in place would be denying who is ultimately responsible for the office of the pope, the Vicar of Christ on Earth. We see precedence for this in Scripture. There was no conclave or popular election for the foremost of the Apostles, the first of the popes, Simon Peter. There were only the words of Jesus: "And so I say to you, you are Peter, and upon this rock I will build my church, and the gates of the netherworld shall not prevail against it. I will give you the keys to the kingdom of heaven. Whatever you bind on earth shall be bound in heaven; and whatever you loose on earth shall be loosed in heaven.” (Matt. 16:18-19). Only God, through His Son Jesus, instituted the papacy and appointed the first Pope; only God continues to appoint successors to Peter through the guidance of the Holy Spirit; only God can decide when a pope can no longer continue his ministry, through death or - in very rare instances - through that individual's prayerful discernment. No earthly authority has the right to usurp that reality. "And when Cephas [the Aramaic name for "Peter"] came to Antioch, I opposed him to his face because he clearly was wrong. For, until some people came from James, he used to eat with the Gentiles; but when they came, he began to draw back and separated himself, because he was afraid of the circumcised. And the rest of the Jews [also] acted hypocritically along with him, with the result that even Barnabas was carried away by their hypocrisy. But when I saw that they were not on the right road in line with the truth of the gospel, I said to Cephas in front of all, 'If you, though a Jew, are living like a Gentile and not like a Jew, how can you compel the Gentiles to live like Jews?'" (Galatians 2:11-14). St. Paul saw that Peter was not practicing what he had been preaching: that, through his Resurrection, Jesus had done away with the Jewish practice of "clean" and "unclean" people and food. But Peter chose not to eat with the uncircumcised for fear of the Jews and Christians who had converted from Judaism. So Paul saw it necessary to publicly rebuke Peter for this error (and, yes, popes can make mistakes - there is a difference between papal infallibility - which is Church doctrine - and papal impeccability - which is not). As a result, Peter changed his ways and acted more in accord with the Gospel he was helping to spread to the world. During the Middle Ages the papacy was in another crisis: there were several antipopes (men who invalidly claimed the papacy) and the legitimate Pope Gregory IX was forced to reign from Avignon, a city in France, because of tension and violence that had erupted in the Holy See; he feared for his life in attempting to return to Rome. Catherine of Siena, an outspoken mystic who was later canonized a saint and Doctor of the Church, continually advised Gregory to return to Rome as it was the proper place for the Vicar of Christ to be (since the pope is also the Bishop of Rome). Despite his misgivings, despite the problems he encountered upon his return, by doing so Gregory reinstated the proper role of the pope and asserted the importance of answering to no earthly power in regard to matters of faith and morals. Notice that in these cases there was never a call for the pope to "Resign! "; rather, the response given to Peter and to Gregory was: "Do your job!" And that is the response that the faithful are called to make in this situation as well. We pray for Pope Francis; his is without a doubt the most difficult job on earth: the spiritual responsibility of every soul on the planet. But, even if he lapsed in some way to that responsibility - due to fear, "political correctness", poor advisors, whatever the reason - it is still his job and his alone. As Pope, Christ's Vicar on Earth, only he can give the direction that will correct the mistakes that have been made and set the Church that Christ established back on the right path. And he needs our prayers and support to do it well. At this time of a most distressing state of affairs in the Church - bishop against bishop, when their guidance as shepherds is needed most - we also pray for our Church and its leaders, that we will stay close to the Good Shepherd and follow Him always. in the Rectory Chapel. We invite all to seek the guidance, help and healing of Jesus in this time of crisis for our Church. "...you are Peter, and upon this rock I will build my church, and the gates of the netherworld shall not prevail against it. I will give you the keys to the kingdom of heaven."